From a HYPE press release: Building on a successful 2006 season which focused on innovation through the selection of artists and their music, the Hamilton Youth Performing Ensemble (HYPE) is proud to announce its 2007 summer production titled "The Dark Side of Oz." HYPE will combine elements of the epic Pink Floyd rock album "The Dark Side of the Moon" with familiar melodies from the classic film "The Wizard of Oz." 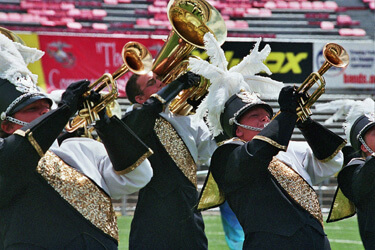 HYPE performs during the 2006 DCI World Championships in Madison, Wis.